These days, I don’t talk much about my first book. I wrote it when I was 7 years old, in collaboration with Dr. Seuss and Roy McKie. As you can see, I improved upon their artwork with the aid of stickers from the United Fruit Company (of whose bananas I was then an avid consumer) and the Kellogg Corporation (whose Raisin Bran I ate for breakfast). As you will soon discover from the interior pages, the handwriting on the latter sticker is not my own (it is my mother’s). The inflatable bunny and the safari suit (my parents are South Africans) dates the photograph to my sixth Easter. At the book’s end, I claim to have finished the book on my seventh birthday. For those unable to decipher my distinctive crayonmanship, favorite foods then included: hamburgers, candy, fruit salad, swiss cheese, and that rare variety of pickle spelled without the “k.” I could not stand olives. This latter claim still holds true, although my favorites have altered. I’m now more partial to pickles with a “k,” and have grown more discerning in my candy consumption: today, I would replace “candy” with “dark chocolate.” I still eat swiss cheese, and plenty of fruit, and, though I enjoy a good hamburger, I would no longer rank it at the top of my list. After all, the job of English Professor combines the fame of the paleontologist with the modesty of the television star. 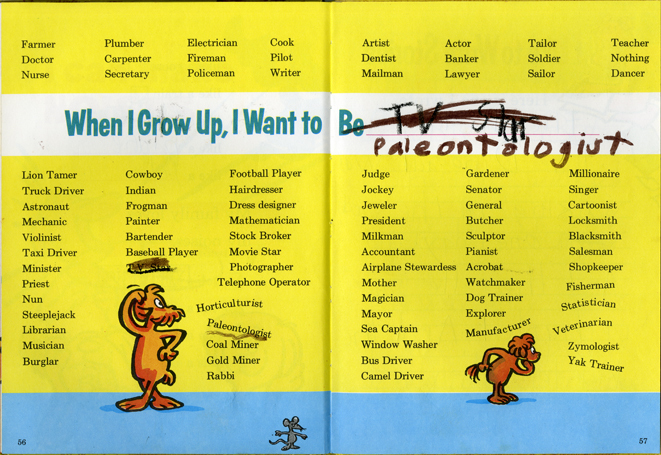 In crossing out “TV star” and writing in “paleontologist,” I was not replacing one with the other, but rather suggesting a hybrid that is the job I now hold. Yes, I was a prescient lad. 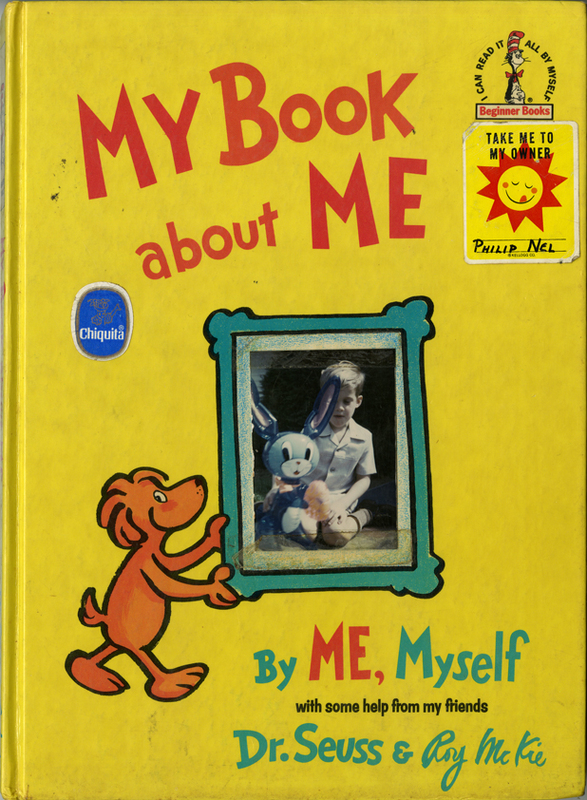 Though many books of this vintage (McKie and Seuss’s portions of this book were written in 1969) have been updated, I’m interested to report that this has not been. Current editions do not replace “Airplane Stewardess” with “Flight Attendant”; nor do they subtract the now rare job of “Milkman” and replace it with, say, “Computer Programmer.” The list of professions remains exactly as it was 41 years ago. The Dinosaur was walking in the woods one day. And then he saw a hunter! And the hunters [sic] gun was ponted [sic] right at him! And the dinosaur was! frightened. But…………… then he walked up to the hunter and was very very very brave. So [he] picked the hunter up by the pants and dropped him. With the unique spellings and unusual grammar characteristic of a gifted author, the story swiftly introduces the rising action in the second sentence. After prolonging the suspense via its deft use of ellipses, the tale concludes with a clever narrative twist that lets readers know they’re reading the work of a master storyteller. The Dinosaur dispatches the hunter through the rarely used picking-up-by-the-pants-and-dropping technique. 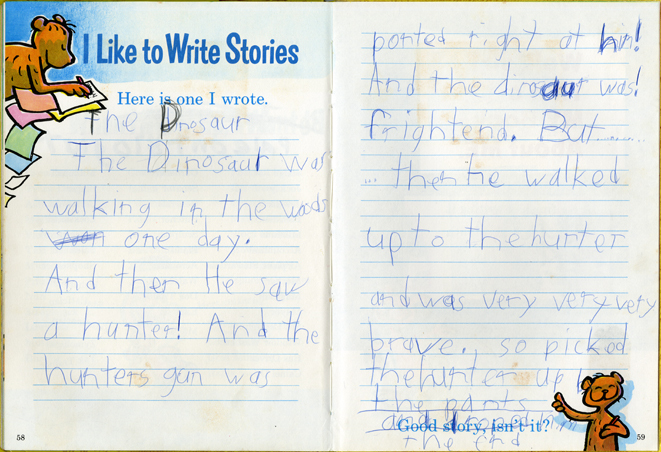 Gasping in delight at this surprising but satisfying conclusion, we salute this 7-year-old wunderkind, who, fortunately, did not grow up to be a writer of fiction. 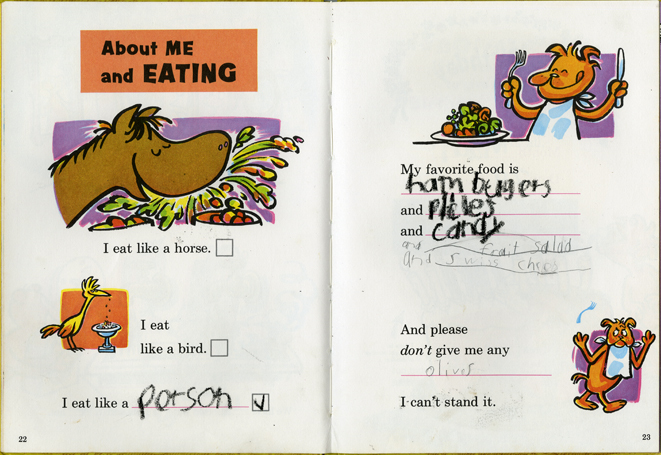 The first page is the best: “I eat like a potson.” I’ve eaten with a potson, I’ve even eaten on a potson, but I’ve never eaten LIKE a potson. Well done, young Phil. You’ll be fine writer one these days, a fine writer indeed. Believe it or not, that is the correctly spelled (but illegibly written) word “person.” Still, I know what you mean about potsons. They are tricky birds to imitate. Simply charming. Thanks for sharing this momentous event of your personal history with us. Oh, thank you, Phil. I laughed so hard I cried. Absolutely adorable. Both the book itself and your witty commentary. Indeed this is a reminder of what a charming and talented small boy you were. Even then I could see the promise of greater things to come. This is nine kinds of amazing! ROFLMAO — mostly because I have the same book, which recently made its way to my house when my mother moved. The handwriting is very similar in mine! A somewhat belated thanks to everyone for your kind comments! I never have any idea which posts will inspire people to respond. Glad you all enjoyed this one!